We had an amazing layover experience touring the city of Dubai. Our guide was personable, knowledgeable, and answered our many questions. We got to see so many things in such a short time! There were several great photo moments, and we felt we got a nice overview of the city. We felt safe, cool (even in July heat!) and comfortable throughout the tour. I would highly recommend this tour to anyone with a layover in Dubai. You get clear details about where to meet making it very easy to exit the airport and find your guide. We are so happy we booked it! Very efficient--easy meeting and greeting by our private tour guide and driver inside our airport terminal. 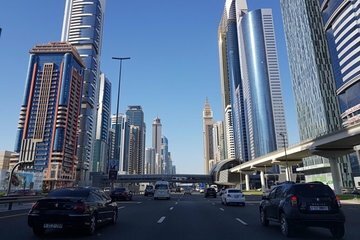 Traveled by private car to see highlights and sights of Dubai including the Burj Khalifa tower with prepurchased time stamped tickets provided for us. Our tour guide and driver were excellent with all the knowledge and driving through traffic experience to make it an outstanding tour. We were also able to adjust some of the tour so that we could see Ski Dubai and walk a bit less. My wife and I had a wonderful time and highly recommend this tour of Dubai. The tour was excellent. The company were very flexible as they were able to pick us up from Port Rashid and drop us off at the airport following our cruise. More detail on the website however would be helpful to understand what exactly is included and how long the tour is.